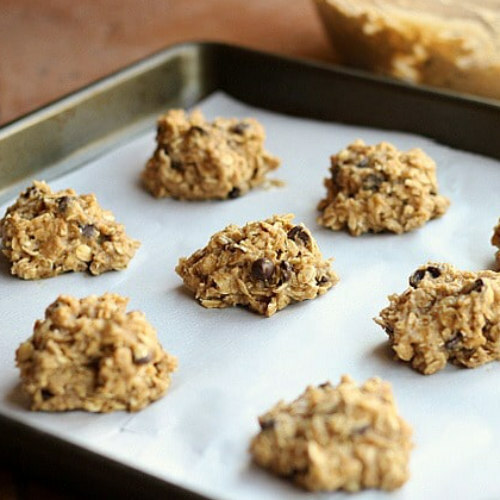 This oatmeal chocolate chip cookie recipe is great for kids ( & adults! ).The oats provide a slow release of energy as well as fibre, whilst the maple syrup and banana give sweetness without the normal refined sugar overload so you don’t need to feel guilty about them! Preheat the oven to 180 degrees and line a baking tray with parchment paper. Whiz up the oats in a food processor and combine the dry ingredients in a large bowl. Mix together wet ingredients (and banana) in small bowl and combine with dry ingredients.